There are just 26,000 wild polar bears left. A wild polar bear was just shot dead after a run-in with an employee of a cruise ship line. The employee was part of an expedition to the archipelago in northern Norway where the polar bear lived. The cruise ship landed on Spitsbergen, in the Svalbard islands, on Saturday and a four-person team of polar bear guards — employees whose job it is to survey landing sites to ensure the safety of tourists as they explore on foot — disembarked. Then, a polar bear appeared suddenly and attacked one of the guards, according to a statement from Hapag-Lloyd Cruises. After first trying to scare the bear away, another guard then shot and killed the polar bear. "One of the guards was unexpectedly attacked by a polar bear that had not been spotted and he was unable to react himself," Hapag-Lloyd Cruises wrote. "As the attempts of the other guards to evict the animal, unfortunately, were not successful, there had to be intervention for reasons of self-defense and to protect the life of the attacked person." The injured employee was airlifted to a hospital with head injuries. His condition is stable and responsive, and his injuries are not life-threatening. The Svalbard islands are a popular tourist destination, especially in the summer months. 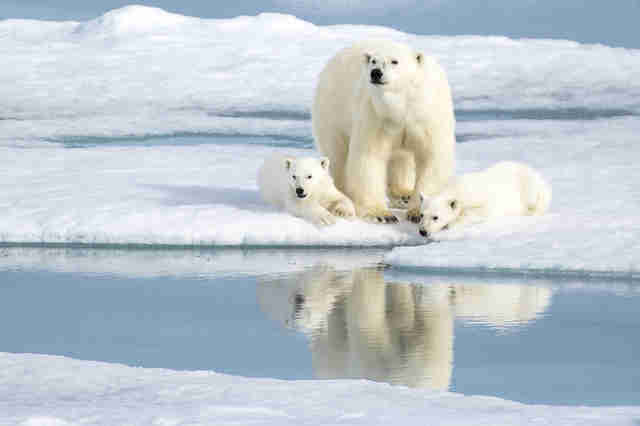 While viewing polar bears in their natural habitat is part of the draw, Hapag-Lloyd Cruises says that the landings are not for this purpose; tourists observe polar bears only from a safe distance offshore. 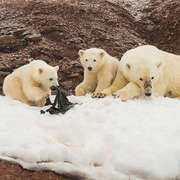 Many people on social media are outraged at the decision to kill the bear, casting doubt on why expeditions like this are offered in the first place considering all the threats polar bears face, from environmental destruction to starvation because they can't access food and a habitat that is literally melting beneath their paws. Scientists predict that polar bears could be extinct in the wild by 2100, according to Polar Bears International. It is estimated that just 26,000 polar bears are left in the wild today. The cruise line says that the death of this polar bear was necessary. ​​"Unfortunately, it was necessary for the polar bear to be shot dead," the cruise line wrote. "We very much regret this incident. Hapag-Lloyd Cruises is very aware of its responsibility when traveling in environmentally-sensitive areas and respects all nature and wildlife." You can help protect polar bears by making a donation to Polar Bears International.